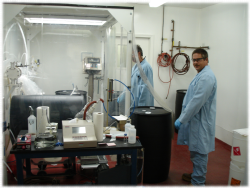 Brand-Nu Laboratories has been specializing in chemical formulations for over 50 years. We are experienced in aqueous and solvent mixtures using various grades of raw materials, ACS reagent, HPLC, low trace metal or commercial, in lab scale to 1500 gallon. These mixtures are made to customer specification in glass and glass-lined systems with 18 megohm reverse osmosis and de-ionized water, if applicable. We can blend and package your custom formulations requirements. Our capabilities range from simple dilutions to multi-component formulations. We have filtration capabilities down to 0.1 um and can work with viscosities up to 1,000 cps. Our customers have discovered that Brand-Nu Laboratories can reduce their on site chemical mixing and provide JIT deliveries for Buffers, Mobile Phases, Acid Etchants, and Solvent Blends. 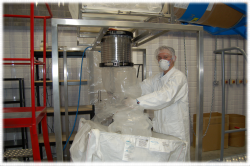 In addition to custom formulations, we will also package to your specific requirements for package type and size. 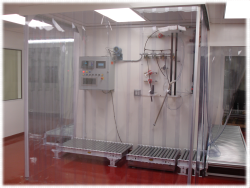 Options include stainless steel returnable containers, poly, poly-lined steel, glass, safety cans, and more. Sizes can also be customized. We currently package from vials to 1000 L totes. We could provide a batch size that eliminates handling for you. For instance, if you add 1.9, 3.15, etc kilograms to a batch of your product, we could package in that specific size for you with a tolerance that you specify. Within our manufacturing facility, we have a class 10,000 clean room containing a high throughput, class 1000 batching system where we produce blends with low ppb impurity levels. We have both polymer and stainless steel equipment trains. We can dedicate equipment to our customer's process, if appropriate, and offer custom packaging and delivery systems.